You are currently browsing the monthly archive for August 2011. Southern Ontario will take a swipe and a miss, mostly, from Hurricane Irene. [Updated 10:00 AM EDT 2011-08-28] Southern Ontario will awake to the outer cloud bands of Irene Sunday morning, and may see rain bands out of the northeast by Sunday evening. The GH-GTA will see only cloud and perhaps the odd light shower, due to the presence of a large dome of high pressure developing over northwestern Ontario. Southwestern Ontario is only expected to receive increased cloudiness. Since Irene’s expected track remains able to feed on Atlantic moisture, periods of moderate rain with gusty winds remain possible in the eastern corner of the province. 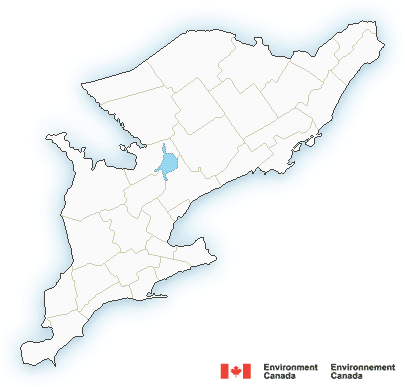 Ephemerata Weather Radar will be set up to monitor the approaching rain bands as they move toward southern Ontario. 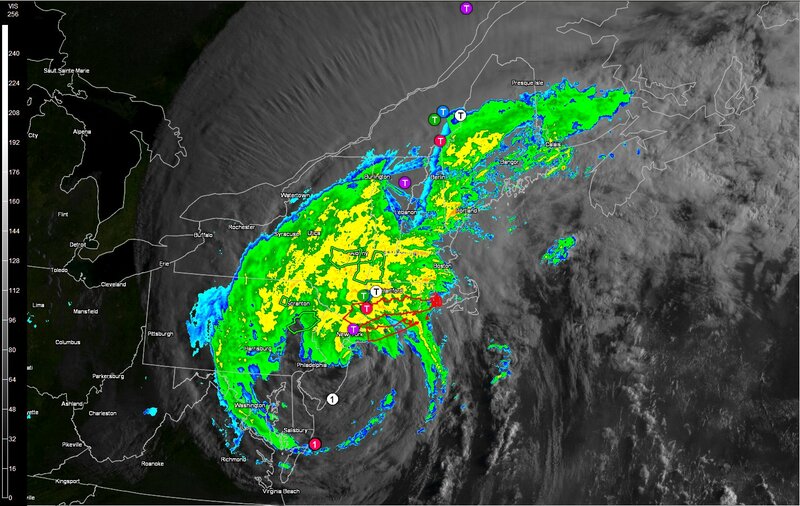 Now downgraded to a tropical storm, the eye of Hurricane Irene moved inland yesterday. Impact with land and the cooler extra-tropical waters has reduced Irene’s intensity to tropical storm status, but Irene remains a very large and locally dangerous storm. Model track guidance remains mostly consistent with the path following up the US seaboard, across New England and over the Eastern Townships and New Brunswick. Irene will continue to be capable of large amounts of rain and strong winds throughout its journey as a tropical storm. Go to our Atlantic and Pacific Hurricane page for more information and links to official monitoring sites. Hurricane Irene 2011-08-28: 07:35 AM EDT: Official track in white. Purple -GFDL model. Blue-HWRF model. Green-GFS model. Red-TVCN model. Numbers in dots are estimated category strength. Storm image is GOES visible view wih NWS NEXRAD radar overlaid. Click on image to enlarge to full size. Environment Canada: Weather summary for Sunday Aug 21, 2011 – Goderich, GTA and eastern Ontario. At 2:15 PM EDT Monday 22 August 2011.
afternoon, associated with a sharp cold front. Other from Arthur to violet hill). And continues to be investigated. Environment Canada as of 5:00 PM Monday. And may not constitute an official or final report. Hurricane Irene may become season’s first significant hurricane. Update 2011-08-27: The eye of Hurricane Irene is expected to move inland later today. Impact with land and the cooler extra-tropical waters has reduced Irene’s intensity to category 1, but Irene remains a very large and locally dangerous storm. Model track guidance remains mostly consistent with the path following up the US seaboard, across New England and over the Eastern Townships and New Brunswick. By this point, Irene is expected to be a weak category 1 or tropical storm. In either case, Irene will be capable of large amounts of rain and strong winds. 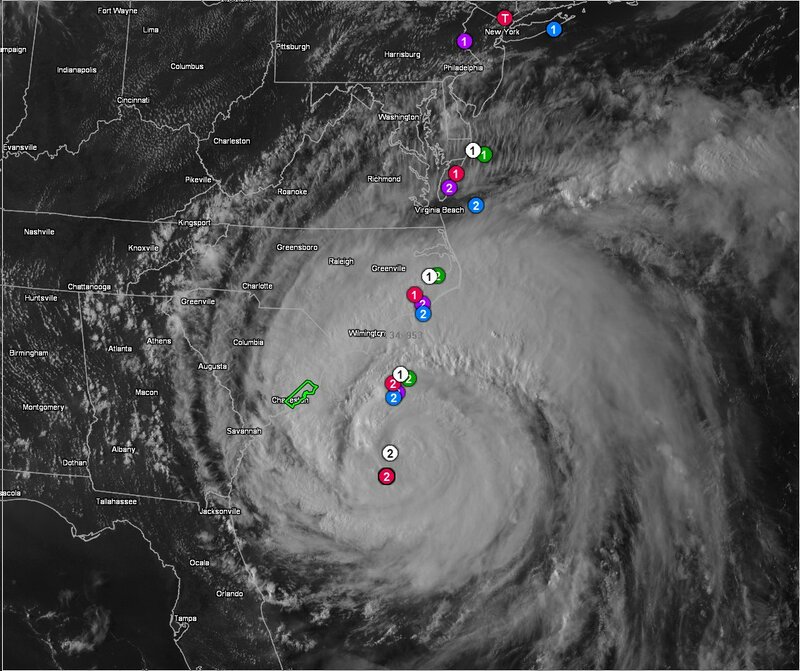 Update 2011-08-26: Preliminary over-flight observations this morning indicate Irene has dropped just below category 3 status. Further analysis suggests that intensification is not likely, but will still make landfall at the Outer Banks at or near category 3 strength in 36 hours. Current tracking places it into New England in 60 hours. Update 2011-08-25: Hurricane Irene is now a category 3 storm on the Saffir-Simpson scale. Further strengthening is expected. Irene is considered a large tropical cyclone, with hurricane winds out to 80 miles and tropical storm force winds out to 290 miles. Update 2011-08-24: Hurricane Irene is expected to reach category 3 later today. Update 2011-08-23: Hurricane Irene is now category 2. Upper level shear is holding back development some, but it is expected to intensify to category 3 (major hurricane) over the next 36 hours. All models are coming into track agreement (see image below). Update 2011-08-22: TS Irene has now attained hurricane status. Expectations are that Irene could become a major hurricane (Category 3 or greater). Tropical Storm Irene continues to develop and represents the first major storm of the season with true hurricane potential. 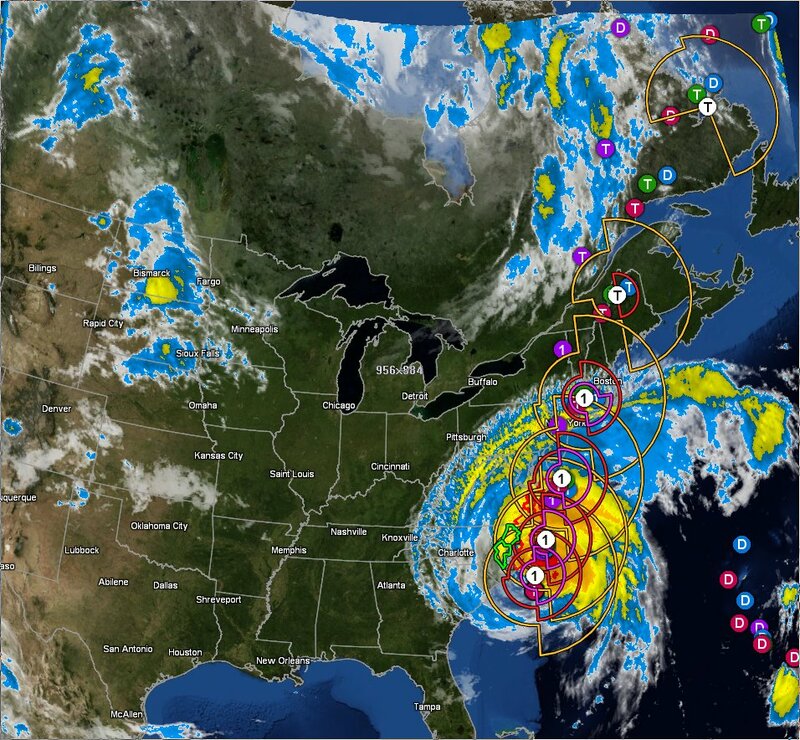 Irene is the 9th named storm so far. Current model track estimates suggest hurricane strength along much of the Leewards and warnings have been raised. The NHC offical track still puts it at a tropical storm reaching Category 1 by the time it gets to Florida. Hurricane Irene 2011-08-27. Official track in white. Purple -GFDL model. Blue-HWRF model. Green-GFS model. Red-TVCN model. Numbers in dots are estimated category strength. Radii about centre are the hurricane and tropical storm wind radii. Light blue traces over the storm are air recon flights (when idicated). Storm image is GOES infared view.